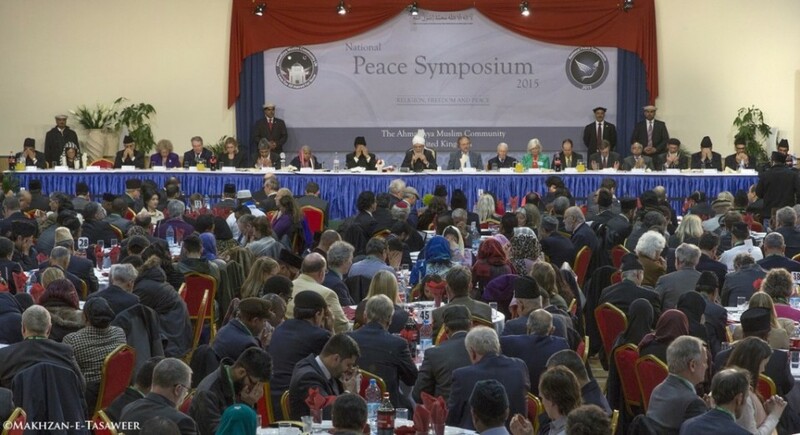 Keynote Address delivered by Hazrat Mirza Masroor Ahmadaa, Khalifatul Masih V, Head of the worldwide Ahmadiyya Muslim Community on 14th March 2015 at 12th Annual Peace Symposium UK held at the Baitul Futuh Mosque in South London. First of all, I would like to take this opportunity thank all of the distinguished guests who have joined us here this evening. This year the Peace Symposium is taking place after an interval of just five months and so I am particularly grateful to our old friends who have again accepted our invitation after a relatively short period of time. I believe that one reason you attend this event is because you wish to hear the views of the Ahmadiyya Muslim Community in relation to establishing peace in the world and its efforts in this regard. However, I also believe that some of you are interested to learn about whether what was said at the previous Peace Symposium has led to any positive outcome or yielded fruitful results. It is good to have a keen interest in such matters and certainly all people should desire that any efforts to promote peace prove successful and are blessed. It is certainly my personal hope that our efforts have had some positive impact in the world. Nevertheless, despite our collective aspirations for peace, the truth is that much of the world is continuing to spiral towards a state of further conflict, disorder and darkness. On a positive note, since our last Peace Symposium there seems to be one small ray of light flickering in the distance and which gives rise to a note of cautious optimism. One of the points I made at the last Peace Symposium was that the world should urgently target and seek to block the funding and supply-line of the terrorist group known as ISIS or I.S. I do not claim that it is because of me, or the fact that I drew attention to this matter, but certainly over the past few months there have been tangible efforts to tackle this crucial issue. For example, in February, the United Nations Security-Council unanimously passed a Resolution directly targeting the funding of ISIS and ordering sanctions to be levied on any groups who sought to illegally purchase oil from it or engage in any other form of trade. If thisResolution is properly implemented then, as I have said before, I believe that it will not take years to defeatISIS, but rather its cruelties can be brought to an end in a matter of months. And so if they are truly sincere in their desire to establish peace in the world, all Muslim countries and their allies should seek to implement these measures to the best of their abilities. Certainly, it is the heavy burden of the Muslim world to give their full support and commitment to this cause. This is because the so-called government or state that has been established byISISis not only committing the most reprehensible and barbaric acts of cruelty – but is doing so in the name of Islam. This is a cause of extreme sorrow for true Muslims as they know that such heinous acts have no link whatsoever to their religion. Recently, a French journalist, who had been kept as a prisoner by ISISfor ten months before being released, spoke about his experiences whilst in captivity. He said that he never saw a copy of the Qur’an during his entire time as a prisoner of ISIS, and when he asked the terrorists how they justified beheading people and their various other cruelties, they never had any answers. They would simply say that they were enforcing their will as they pleased and would continue to do so. The United Kingdom should be particularly concerned because, according to the journalist’s account, extremists who had travelled to Syria from Britain were committing some of the worst atrocities and were even more brutal than the other extremists. Clearly, this is an issue of grave concern for the British authorities. On an almost daily basis in the news there are reports of youths, both male and female, who have been radicalised here and have either travelled to Syria or Iraq or who have been arrested here for various terrorism-related offences. Radicalisation is therefore a serious problem for the United Kingdom, for Europe and indeed the wider world. And so governments are rightly voicing their concerns and are debating the means of tackling this issue. However, the proper and appropriate measures are still not being taken to confront it. For example, here in Britain, the police and intelligence agencies have admitted that some of the radicalised people who have gone to Syria and Iraq were not properly monitored, and if they had been, they could have been prevented from leaving the country. Anyway, and as I have indicated already, it is not just the Muslim world that should be worried about the current state of affairs. Rather, it is a cause of serious alarm for the entire world because if the extremists who have gone abroad return to their countries of origin, it could lead to dire consequences and potentially great danger to that society. In terms of the reaction of world leaders to ISIS, it has been pleasing to see that certain politicians and religious figures have chosen not to add fuel to the fire but have instead made it clear that they do not believe that ISIS or any other terrorist group represent the true teachings of Islam. For example during a recent speech in Washington, President Obama said very clearly that the terrorists were betraying their religion and had no link with Islam. Just a few days ago, the Catholic Archbishop of New York, also spoke openly against the notion that Islam justified the terrorist activities of groups like ISIS. And here in Europe, certain broad-minded politicians and religious leaders have also reacted responsibly to the terrorist attacks falsely perpetrated in the name of Islam. For example in January, as I am sure you will all be aware, terrorists attacked the offices of the magazine Charlie Hebdo in Paris. It was a horrifying attack and completely against the teachings of Islam. When the issue of free speech arose in the days that followed, Pope Francis said that we should not provoke one another or insult each other’s faiths. He said that the dignity of each faith and religion should be respected and that we should speak for the common good. In my view, it would be far more effective for the major powers to support the local governments, by taking them into confidence and seeking to build a relationship of mutual trust. Through close co-operation a joint-strategy should be formed to stop the spread of extremismand its hate-filled ideology. This will surely prove more effective than opposing the local governments by giving military training and weapons to the local rebels. Such policies can only further inflame the existing turmoil and tensions in those countries. Indeed, we have already seen the dangers and folly of this policy. Some time ago, certain major powers gave military training to members of the Syrian Opposition and it was later widely reported that many of those same rebels had taken their newly acquired arms and training and joined terrorist groups. Yet despite this precedent, it has now been announced that thousands more Syrian rebels are going to be given military training in Turkey, Qatar and Saudi Arabia. I believe it would have been far more constructive for the major powers to build bridges with the local governments and to help them end the terrorism in their countries. This support could have been given on the condition that the respective governments guaranteed that they would serve their citizens fairly and would not usurp their rights in any shape or form. Where in Syria, Iraq or certain other countries the public have stood up against their governments it has led to a power vacuum, which has been fully exploited by extremists to its great benefit. The civil disorder and lawlessness in those countries has allowed terrorist organisations to establish a foothold and created the perfect environment for them to flourish. As I have said, people from Europe, Australia, even China and other parts of the world have travelled across borders to join ISIS and the repercussions of this will certainly be felt in Europe and the West. Therefore, there is no doubt that this is not just an issue of concern for the Muslim world, but rather it is a global issue and has the potential to increase conflict across the world. In short, the measures to curb extremism are proving ineffective. If we look at the case of Libya, just a few years ago some powers helped the local rebels to remove the Gaddafi regime. But what did this achieve? Has there been any benefit or improvement in the lives of the Libyan people? Certainly not! Rather that country has been left devastated, divided and in ruins. It has become a breeding ground for terrorism and instability. It is said that even Gaddafi’s hometown is now under the control of terrorists linked to ISIS and this town is only 300 miles from Italy’s coast. Thus, analysts have said that in this way extremists have now virtually reached the doorstep of Europe. If we look at Eastern Europe – there are radicalised individuals who are not only going to Syria and Iraq, but are also travelling to join terrorist groups in Afghanistan and Pakistan. Indeed, Pakistan and Afghanistan have long been extremely unstable countries where terrorism and extremism have been prevalent. This too is a continuous cause of great concern. Then if we turn towards Africa, terrorist groups such as Boko Haram and Al-Shabab are acting entirely against the teachings of Islam by perpetrating the most barbaric cruelties. The ramifications and effects of this will not remain confined to these African countries, but rather will be felt in the wider world. And it is not just in the Muslim world that we see disorder and conflict. For example, the situation in Ukraine remains unresolved and highly dangerous. Although a tentative ceasefire was recently signed, a further escalation of the conflict and a future war cannot be ruled out. The major powers would be unwise to underestimate the threat posed by that region. Much has been written and said about how more than twenty five years after the end of the Cold War, political tensions and other serious issues have engulfed the region once again, the economic situation being one of them, and this cannot be taken for granted. Another issue we are seeing is that various governments are increasing their military spending. For example, China’s Government recently announced that it was vastly increasing its military budget for the forthcoming year. However, its budget remains less than some of the other big countries. The point is that nations are competing with one another and seeking to outdo each other in terms of their defence spending. This race to increase military budgets is not without reason, but in fact there are underlying motives behind it. If we truly want peace then the United Nations and the major powers need to urgently tackle these issues in a just and fair manner. If we observe the situation in the Middle East it is clear that the hatred and hostility between Israel and Palestine is continually increasing and at frequent intervals this enmity erupts into senseless violence and bloodshed. Then, we are all aware that relations between Israel and Iran are highly volatile. For a long time there has been a complete lack of trust and mutual hostilities seems to be increasing on a daily basis. In short, the vast majority of the world is engulfed in a state of disorder and conflict. Regrettably, the world has failed to devise an effective plan or strategy to free mankind from this desperate state. Underlying issues and root causes are being ignored or at least not given the serious attention they require. Every country believes that its policies are right and that others are in the wrong. Many countries believe that what is happening in other parts of the world will not affect them. Such beliefs and perceptions are mistaken and can only prove to be harmful. Even where attempts are made to establish peace they are often futile, because strategies to resolve the problem or situation taken an unnecessarily long time. Thus we should realise and recognise the critical need of the hour. And whenever planning to control the situation, it should be in a minimal time. We must accept that peace can only be built upon the solid foundations of honesty, integrity and justice. These are the keys to peace. Until there is honesty and justice no solution will ever prove beneficial. 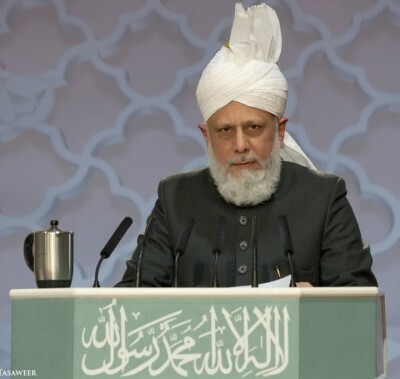 In terms of our community – we, the Ahmadiyya Muslim Community, have no power or worldly influence. Our objectives are purely spiritual and so we do not seek power or government. We have no political ambitions or objectives. As a religious community we desire only that the world comes to recognise its Creator and that people fulfil the rights of one another. To fulfil these twin objectives we make every possible effort in all parts of the world. We seek to inform others that Islam’s teachings have no link with the violence and disorder witnessed in the world. And so I shall now present a few of the basic teachings of Islam in relation to the establishment of peace. However, before doing so, I would like to make it clear that the blame for the disorder in today’s world cannot be solely attributed to Islam or Muslims alone. In fact, there are many other reasons and factors that are fuelling the unrest prevalent in much of the world. I have already indicated towards this point by saying that it is only when justice and honesty prevail that we can move towards a truly peaceful and harmonious world. There is no doubt that major powers and certain political and religious leaders are motivated by greed and their vested interests. Their selfish desires have contributed to the desperate state of affairs that we are witnessing and so responsibility also lies with them. The world is being consumed by various issues that are leading to frustration and resentment, which in turn are undermining peace. For example, the effects of the financial crisis continue to be felt in much of the world. In Europe, discontent is increasing and the integrity of the European Union is being challenged and undermined. Anti-immigrant or nationalist parties are gaining popularity in many countries. I have already mentioned the conflict in Ukraine and the global arms race. These are all threats to world peace that are not linked to Islam, but rather have developed as a result of an unquenchable thirst for power, influence and resources. If we reflect upon the policies of the major powers we see that whilst they do not overtly subjugate weaker nations, they do seek to influence them unduly, by exerting their control and taking advantage of their resources. This is not anything new that I am saying but is quite apparent to all. And so wherever in the world there is conflict and violence – whether conducted in the name of Islam or not – the truth is that the perpetrators are never motivated by any religion but only by their own desire to attain power. If we reflect upon all of these points it compels any sensible person to question the direction the world is moving towards in order to pursue and fulfil materialistic desires. As far as Islam is concerned, we see that in this era, Islam’s teachings are being constantly misrepresented and distorted. It is claimed that Islam promotes a violent Jihad and bloodshed. However nothing could be further from the truth. And so let me make it clear that when the early Muslims were permitted to fight by the Allah the Almighty, permission was not granted just to protect the Muslims or Islam itself. Rather, this permission for a defensive war was granted to protect the religious freedom ofallpeople. In Chapter 22, Verses 40-41of the Holy Qur’an, Allah the Almighty said that if the Muslims did not defend themselves at that stage then no church, synagogue, temple, mosque or any other place of worship would remain safe. Therefore, where Islam gave permission for a defensive war, it was granted in order to safeguard every single religion and to protect the right of all people to freely practise and profess their faith. If a Muslim seeks to harm any other person, regardless of their faith or belief, or if any Muslim tries to damage the sacred places of other people, then he or she acts in complete violation of this very clearQur’anic injunction. In relation to this, there have been recent reports that ISIS has destroyed historical monuments and artifacts in ancient Iraqi cities. For more than 1400 years these cities were preserved and protected by successive Muslim rulers and governments and now it has been destroyed in Islam’s name. This can only be branded as an extreme cruelty and a transgression of Islam’s teachings. No true Muslim could ever comprehend acting in this way. Regarding the true concept ofJihadand Islam’s peaceful teachings, I cited many Qur’anic references during my address at last year’s Peace Symposium and there is no need to repeat them all now. However, certainly the verse I have just mentioned makes it clear that what is commonly alleged about Jihad is completely wrong. Furthermore, in Chapter 10, verse 100 of the Holy Qur’an, Allah said to the Holy Prophet (peace be upon him) that if Allah had desired he could have enforced His Will and compelled all of mankind to believe. Yet Allah gave each person freedom of choice, and given this, what right did the Holy Prophet (peace be upon him) or indeed anyone else have to force or compel others to accept Islam? Throughout his life, the Holy Prophet of Islam (peace be upon him) greatly emphasised the need for justice and equity and for all forms of cruelty to be stopped. Indeed, it is narrated that the Holy Prophet (peace be upon him) said that a person should help both the oppressed and the oppressor. It is obvious that helping the oppressed requires you to show love and compassion, to protect them, to free them from their difficulties and to comfort them. However, the Holy Prophet (peace be upon him) said that we should not stop there, but we should take the next step and even help the oppressor. And helping an oppressor requires that a person stops them from committing injustices and cruelties. These are the means of creating peace amongst people. If today’s governments followed this basic principle and prioritised justice and helping others over and above their own interests, the world would be a far better place. Whilst all governments and leaders claim they are trying to establish peace and justice, the sad reality is that they continue to prioritise their own agendas, interests and motives. In Chapter 2, Verse 189 of the Qur’an, Allah says that you should not consume the wealth of others through falsehood and injustice. And then in Chapter 15, Verse 89, Allah the Almighty says that you should not covet the wealth or resources of others. When I quoted this verse in my Capitol Hill address, one congressman came to me and said you have very rightly pointed out not only the teaching but the reality. In Chapter 5, Verse 9, Allah the Almighty has said that you should not let the enmity or hatred of others incite you to act otherwise than with justice. What a truly magnificent standard of justice and honesty this is. And for the sake of protecting the sanctity of religion and to prevent disorder in the world, Allah the Almighty has said in Chapter 6, Verse 109, that you should never insult or speak ill of the idols or deities of others because then they may be provoked into insulting Allah and this will lead to a never-ending cycle of enmity and hatred. Then the Holy Prophet (peace be upon him) said that when you abuse or disrespect someone’s father, you abuse your own father. See how beautifully limits of freedom of speech and respecting honour have been laid down. Thus whosoever trespasses it contravenes the commands of Allah and the Prophet. In Chapter 60, Verse 9, Allah the Almighty has said that those who do not persecute or seek to obstruct your faith should always be treated with fairness, respect and kindness. Thus, it is entirely contrary to Islam’s teachings to be cruel to those who are living peacefully amongst you in the Muslim countries – whether they are Christians, Jews, Yazidis, Pagans or the people of any other beliefs or even Atheists. Thus, these are the golden principles and teachings that are required to establish peace in the world. I have presented just a few aspects that highlight the beauty and nobility of Islam’s teachings. These teachings are the means of protecting all people in the world. And it is due to these very teachings that true Muslims act as guarantors and guardians for the peace and security of all segments of society. Seated before me are various politicians, influential figures and well-educated people and so I wish to reiterate that you should all try your level best to influence your governments and leaders positively towards establishing justice and honesty at all levels. These are the keys to solving the many international and domestic crises of our time. For many years I have warned that we are heading towards a horrific destruction and now many politicians and analysts are reaching the same conclusion that we are heading rapidly towards a Third World War. Whilst some are saying that another World War is now unavoidable, I believe that even now there is time for the world to wake up to the stark reality it faces and to arrest this threat. To do so, all people and their leaders will need to stop looking only in one direction and caring only for their own interests. Instead, they will need to broaden their outlook and to have a realistic and fair approach in all of their matters. They must seek to fulfil the requirements of justice, fairness and honesty at all levels of society.